These days anytime something goes up someone is almost sure to call it a bubble. This is especially true of anything that resides in the public eye. Index funds and ETFs fit the bill here which has led to a chorus of investors, mostly of the active fund management variety, to call these products a bubble that is sure to pop. I wrote the following piece for Bloomberg to dispel this theory. The explosive growth in exchange-traded and index funds is causing the money management industry to freak out. Some are worried these vehicles will destabilize markets. Others are concerned fundamental analysis is no longer being rewarded. Another group feels the rise in passive investing could be hurting economic competition and growth. There has been substantial growth in recent years in the number of ETFs, which have climbed well above 2,500 in the U.S. alone. But there are also more than 16,000 mutual funds, which dwarf ETF assets by a factor of 4-to-1. ETFs are simply a new vehicle. The shift to low-cost investment funds represents an enormous wealth transfer from overpriced, underperforming fund management companies to investors in the form of lower fees. This is a huge win for the investor class. Closet indexing was the real bubble that is currently popping. You’ve never heard about it because the fund companies could extract such high fees in these funds. Saying there’s a bubble in index funds and ETFs is like saying there’s a bubble in the number of investors in the markets. The numbers don’t back this claim. 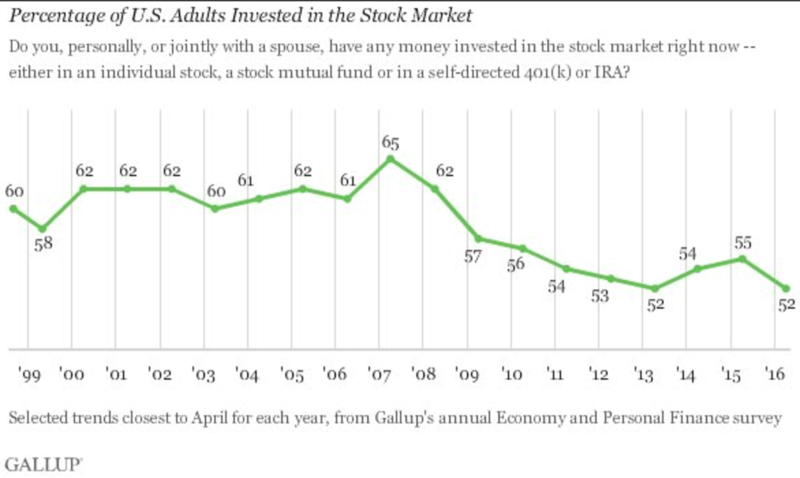 According to Gallup, the average percentage of Americans who own stocks was 62 percent from 2001 to 2008 but dropped to just 54 percent from 2009 to 2017. The top 10 percent of investors hold 90 percent of the stocks and funds in this country. The realignment into index funds and ETFs is simply a shuffling of the chairs, so to speak. Some are also worried that all the new money pouring into these funds will panic at the first sign of a downturn. But those investors who end up panicking and selling ETFs or index funds en masse during volatile periods are the same ones who would have been selling individual stocks or actively managed mutual funds in the past. ETFs simply offer these investors a cheaper product they can use to panic with their money. Getting rid of ETFs and index funds would make it much harder for individual investors to gain access to the markets in a cost-effective manner. This would be akin to wanting to bring back wider bid-ask spreads, lower market liquidity or higher trading commissions. Sure, some professional investors would fare better, but markets as a whole would be worse off. Those who are concerned that indexing is causing a market bubble don’t realize that active investors have had no trouble doing so in the past when index funds didn’t exist. There were no index funds during the Roaring 20s that led to the Great Depression nor in the go-go years in the 1960s that led to the Nifty Fifty blow-up. These funds had nothing to do with the brutal 1973-74 bear market because they weren’t even invented until 1976. Another concern is that there will be fewer market participants to ensure market liquidity and relative efficiency. Obviously, active investors provide a valuable service because they create liquidity for market participants. But there are far fewer active investorsneeded to keep things afloat than most in the finance industry would have you believe. People in finance often debate what would happen if everyone indexed but we need to put things into perspective. Active management still dominates financial markets. According to Vanguard CEO Bill McNabb, though indexing represents more than 30 percent or so of mutual funds in the U.S., it accounts for only 15 percent of the entire U.S. stock market and less than 5 percent of global assets. Indexing has a long way to go until it becomes the majority of global fund assets. And it’s not as if the flows to ETFs are lifting all boats in the stock market. The S&P 500 is up about 9 percent this year, but for every Apple (+26 percent) and Amazon (+22 percent) there are companies such as Foot Locker (-31 percent) and Verizon (-19 percent) that have gotten killed. More than 160 stocks are down in the S&P 500 in 2017, with close to 90 names down double digits. If indexing indiscriminately pushes up all stocks then why would any of these stocks be falling? I’m not suggesting that index funds and ETFs have no impact. The biggest problem with ETFs for investors is they trade them far too often, meaning they’re not passive investments at all. They’re low-cost trading vehicles that end up nullifying any gains in cost advantage to behavioral mistakes. But the move to low-cost investing is a secular shift. That’s the biggest idea those who call these things a bubble fail to realize. Those in the fund management industry who fail to understand this sea change risk being left behind by cost-conscious investors.